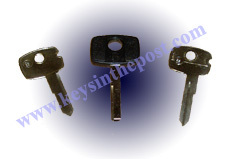 A key for Vauxhall or Opel cars manufactured between 1965 and 1995 cut to number or photo. Models Include: Wyvern, Velox, Cresta, Victor, VX 4, Ventora, VX1800, VX2300, Viva, Firenza, Magnum, Chevette, Royale, Lotus Carlton, Admiral, Kadett, Ilimpya, Rekord, Corsa, Ascona, Manta, Monza, Senator, Commodore, Vectra, Omega, Calibra, Cavalier, Astra, Frontera, Monterey. 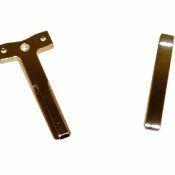 A key blade for Vauxhall or Opel key remotes, cut to the locks on your car. Models Include: Astra 2004 on, Signum 2002 on, Vectra 2002 on, Zafira 2005 on. These keys can only be cut to key number, which is normally provided on a card with the service documentation. 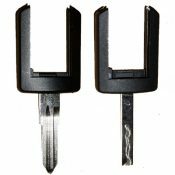 A key blade for Vauxhall 2 and 3 button remotes, cut to the locks on your car. 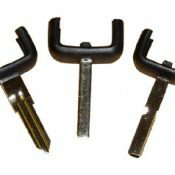 A key blade for Vauxhall Corsa and Combo 2 button remotes, cut to the locks on your vehicle. An emergency key for Vauxhall and Opel cars, cut to fit the locks on your car. This key will suit most models from 1995 onwards. Models Include: Agila 2000 onwards, Antara 2007 on, Astra 1995 on, Calibra 1995-1998, Cavalier 1995-1998, Combo van 1995 on, Corsa 1995 on, Frontera 1996-2004, Insignia 2008 on, Meriva 2002-2007, Movano 1999 on, Omega 1995-2003, Signum 1995 on, Sintra 1997-1999, Speedstar 2001-2005, Tigra 1995 onwards, Vectra 1995 on, Vivaro 2002 on, Zafira 1999 on. We do not use original Vauxhall blanks, we use high quality steel blanks manufactured by Silca. 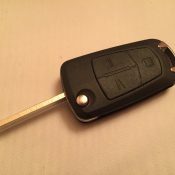 This listing is for a single Vauxhall Vectra C key remote case, with a blade cut ready to fit the locks on your car. This key case is compatible with all Vectra C and Signum models from 2005 – 2008. This key is a plastic case only, there are no electronics included, and the key won’t start the engine until you have swapped your electronics into it. 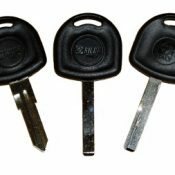 This key case can be used to repair flip remote keys only, it can’t be used to convert a key into a flip key. This key case can be used for keys with both two and three buttons. The key number is normally provided on a card with the service documentation.